Disney Springs is now the top place to go for a great meal at Walt Disney World, and this post ranks of its best table service restaurant options. The dining scene at Disney Springs is exceptional and varied, with something for everyone at a range of price points. As one of our friends has put it, Disney Springs is “where you’ll be saying yum and wow every 5 seconds.” (Stacy from ‘Must Do Disney‘ counts as a friend, right? I mean, I feel like we’ve watched her on loop enough that she counts.) Seriously, though, Disney Springs has really been rejuvenated in terms of dining. While we still miss Pleasure Island and the Downtown Disney ‘scene’ of about a decade ago, the quality of the restaurants in Disney Springs have improved by an order of magnitude over 5 years ago. What a difference 5 years makes–and Disney Springs still isn’t done! In fact, we totally skipped Downtown Disney on every trip for several years after Pleasure Island closed, so we had to play catch-up with our Disney Springs restaurant reviews for a while. During a recent trip to Walt Disney World, we stayed in the Disney Springs Resort Area, and walked over to Disney Springs over a dozen times. Of course, with more new restaurants opening regularly, we won’t be caught up for long. Wolfgang Puck Bar & Grill has opened since we last updated this, and Jaleo opens this month or next (officially “Early 2019”). This list strives to rank the Disney Springs restaurants, accounting for food quality, atmosphere/theme, and value for money. The difficulty with this list of the best Disney Springs restaurants is that there are few apples to apples comparisons. Every restaurant on this list except for Planet Hollywood Observatory has compelling offerings and by no means should be considered bad options. In fact, (almost) all of the Disney Springs restaurants are so different from one another that those considering one of them are not going to find the others to be a suitable alternative. 14. Planet Hollywood Observatory – With foods toeing that undesirable line between “barely suitable for human consumption” and “heart-attack inducing,” Planet Hollywood Observatory is one of the worst restaurants at Walt Disney World. The comfort style food, fun menu, and introduction of a menu by celebrity “chef” Guy Fieri should have helped. Alas, nothing could save this disaster of a restaurant. A visit to Flavortown is less enjoyable than a visit to the doctor and, ironically, the former might get you sent to the latter. It’s still better than Planet Hollywood used to be, but that is such a ridiculously low bar that it barely merits mentioning. With so many good alternatives at Disney Springs, it should be criminal that Planet Hollywood Observatory uses the name cachet of a famous chef to lure unsuspecting prey into this tourist trap. 13. 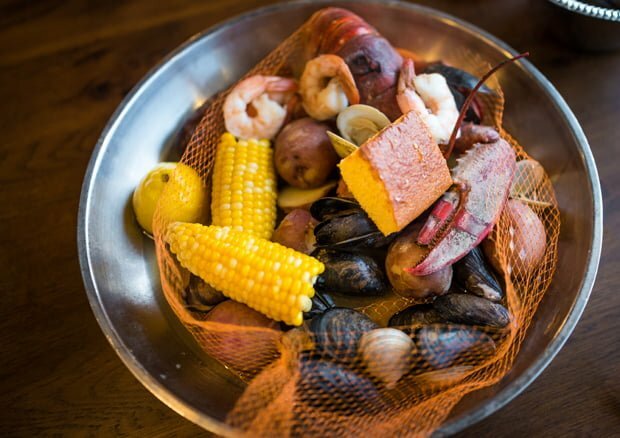 Paddlefish – We’ve now dined at Paddlefish twice, once for a special event and another time specifically for the $70+ New England Seafood Boil. Both times, I’ve left incredibly underwhelmed with Paddlefish. For such an expensive restaurant, it seems bland and forgettable–and that’s true of both the menu and the design. The ambiance is ‘generic upscale blah’, and the food we’ve sampled has not been impressive. It’s not bad, but for a seafood restaurant with fine dining price points, Paddlefish has left a ton to be desired. I’m not sure if/when we will go back to try more for a full review. At this point, it’s incredibly difficult for us to justify spending that much money given the wealth of exceptional (and cheaper) options at Disney Springs. 12. Jock Lindsey’s Hangar Bar – I hate to put this in “last” place, especially since it’s one of the best themed bars at Walt Disney World. It’s also a tough ranking since the menu has changed since our last visit, which could nullify some of our concerns. With that said, Jock Lindsey’s is a late night spot we recommend after you’ve already filled up (on both food and drink) as our service here has been so abysmal and the items so inconsistent that actually expecting a substantive dining experience here may lead to frustrating results. 11. T-REX Cafe – Who would’ve expected the sister restaurant to the infamous Rainforest Cafe to be tolerable–let alone good? Certainly not me. While I am admittedly biased towards dinosaurs, I fully expected this to be a cut rate “themed” restaurant with a few dinos with limited range of motion and some other haphazard decor. It is so much more, and actually a fun place for dinosaur-loving kids (AND ADULTS. WE CAN LOVE DINOSAURS, TOO. THERE’S NOTHING “IMMATURE” ABOUT ADULT DINO-ENTHUSIASTS.) and their families. The food is basic American comfort food through and through, but it’s actually pretty good. 10. Enzo’s Hideaway – We visited Enzo’s Hideaway a few times during its opening week, albeit mostly for drinks, appetizers, and desserts. Our experiences were inconsistent, but I’m willing to chalk that up to the bar/restaurant still finding its footing–no penalty there, especially considering our great experience at Enzo’s other restaurant. One thing that we do highly recommend at Enzo’s Hideaway is the gelato sundaes–absolutely fantastic. Our problem with Enzo’s Hideaway that causes it to rank where it does is not the food, but the theme. It feels like the design was changed halfway through the project (and given the troubles and delays with Patina’s project here, that probably isn’t far from the truth). The end result can charitably be described as a hodgepodge, and the repurposed quality feels too contrived and jarring with the cool prohibition/smuggling components. If you’re thinking of going here, we’d encourage you to step in solely for a drink or dessert first and see how you like the setting. From our perspective, the Edison and Maria & Enzo’s Ristorante (both of which are connected and share a kitchen) are much more compelling options. 9. Frontera Cocina – When we originally published this list, we complained that the decor is blandly ‘modern chic’ and the whole experience is totally forgettable. Thanks to improvements to the design (namely, the addition of a beautiful mural that is the centerpiece of the seating area), we’ve bumped it up a spot on this list. Frontera Cocina still lacks the level of character that makes for a uniquely Walt Disney World offering. However, the main courses are fairly solid and make for a great option if you’re in the mood for Mexican cuisine. Frontera Cocina’s main selling point is its incredible desserts, which make it an ideal choice for a progressive dinner, or a sweet nightcap. 8. STK – If you read the original incarnation of this list, you might recall that I said we’d never drop the chunk of change necessary to dine at STK, an expensive steakhouse with Vegas-style ambiance that struck me as grating (what can I say, I’m a surly ole curmudgeon). Well, a lot has changed since STK opened. Namely, the menu now has specials (great small plates during Happy Hour and more) and vibe has been toned down considerably. In other words, things that are right in the wheelhouse of an old timer like me. With those key differences, I had little excuse to continue refusing to visit. To my surprise, STK served up some excellent food at reasonable prices and had a perfectly-fine ambiance. If anything, the atmosphere and theme were on the muted side, making it fairly humdrum. The food was high-quality and represented a great value, too. I cannot say the same (yet) for the full menu and those pricey steaks, but now that I’ve tested the water on a cheaper meal, I am curious about going back and trying some of their signature items. That’s something I never expected to say, and STK still would not be my first choice at Disney Springs, but it’s clearly a restaurant headed in the right direction, and a choice that now feels at home in Walt Disney World. 7. Splitsville – Not being big bowlers, we held off on going here for a while after its opening. After hearing from a friend* (*yeah, Stacy again) that “the menu is unexpected,” we finally decided to give it a try. We were impressed with both the retro-inspired atmosphere (including the glorious Vacation Kingdom of the World mural!) and the cuisine. Like T-Rex, Splitsville is standard American cuisine, but there are some inventive options, too. It’s not nuanced fine dining like you might find elsewhere on this list, but the food tastes great and is fairly priced. Beyond that, the convivial atmosphere makes this a great place for larger parties looking to have a fun night outside the parks. It ranks so highly because it’s solid, approachable cuisine at relatively reasonable price points. It won’t necessarily wow you like other options on this list (even ones that rank lower), but it’s a reliable option and great for families. 6. Maria & Enzo’s Ristorante – Walt Disney World has a surplus of Italian restaurants, but problematically, Walt Disney World does not have a lot of great Italian restaurants. When judging the complete package, we’re inclined to rank newcomer Maria & Enzo’s Ristorante at or near the top of the heap. The food here is good, with a focus on authenticity and high quality ingredients. However, prices are high and not every dish hits the mark. Nonetheless, most of the cuisine is very good (or better). That, coupled with a wonderful theme and atmosphere modeled after an airport terminal during the golden age of aviation–a subdued theme that works surprisingly well–is enough to elevate Maria & Enzo’s. It shouldn’t be a top pick on your first visit to Walt Disney World, but after you’ve been to Disney Springs a few times, it’s a worthy restaurant to add to your rotation. 5. Homecomin’ – Southern down home cooking with a flair, Chef Art Smith’s Homecomin’ is a nice middle ground between comfort food and gourmet cuisine. Many menu options are southern favorites with ambitious twists, and (more importantly) the food is out of this world. Outside of the Grand Floridian, this is probably the most authentic “Florida” cuisine you’ll find at Walt Disney World. Homecoming has some of the best fried chicken you’ll ever try, and other menu items are both high quality and delicious. The restaurant’s design is not the most ambitious, but it’s inviting and has a down-home charm that scores some points even if it’s objectively lackluster. 4. The Edison – If this were a ranking of the top bars at Disney Springs, the Edison would run away with the #1 spot, besting staunch competition from places like Raglan Road and Jock Lindsay’s. It’s that unique, has solid drinks, is strong on theme, and the entertainment is superlative. When you set all of that aside and visit during midday hours solely for the food, the Edison still manages to score high marks. The Edison is actually what has caused other American comfort food options like Splitsville to fall out of favor. Cuisine-wise, the Edison bests them with more inventive and ambitious takes on familiar favorites. We especially love the lamb burger and Electri-Fries. The Edison is also one of the few instances of Disney Springs’ typical repurposed style working very well and feeling organic. While the Edison is at its peak in the evening hours, you should have a good time and great meal no matter when you visit. 3. Morimoto Asia – If I could only use one word to describe Morimoto Asia, it would be “haute.” Now, if you’re from Los Angeles or New York, you might question whether I know what that word means (and what’s it to you if I don’t?! ), but as far as Walt Disney World goes, this is about as close to haute, in both style and cuisine, as a restaurant gets. The style at Morimoto Asia is trendy & chic, the menu is ambitious, and the atmosphere is hoppin’. On top of that, there are many menu items that are really good (and some price points are reasonable–even after like 8 price increases). For couples, this is a great spot for putting on your finest pair of bell-bottoms (or whatever the current trends are in haute couture) and having a fun date night. 2. Raglan Road – The OG of Disney Springs dining from back in the day when it was still Downtown Disney (so, only like a year ago, but it sure feels longer ago than that), Raglan Road has been neglected by many fans with so many great new options opening. We recently revisited Raglan Road at the behest of friends, and it was every bit as delicious and jovial of an atmosphere as we remembered. There are some excellent menu options at Raglan Road, and the Bread & Butter Pudding is like an org–uhh…happy burst of excitement–in your mouth. (Seriously, top 5 Walt Disney World dessert). The atmosphere is like something straight out of World Showcase at Epcot, with a cultural authenticity that gives the restaurant added allure. All of this puts Raglan Road right up there as one of the best restaurants at Disney Springs. 1. The Boathouse – While the excitement of anything new brings with it a bit of hype (and “BEST EVA” proclamations), the one restaurant in Disney Springs with a reputation that has held steady post-opening is The Boathouse. At first, I wasn’t so keen on the ambiance. The motorboats on the walls reminded me a bit of a boat-themed Cracker Barrel, which seemed at odds with the Signature status. Even the decor at the Boathouse has grown on me a lot; different rooms in the restaurant offer differing ambiance (the Dockside Bar being a particular favorite of mine). Then there’s the food, which is almost all excellent (they, too, have a top 5 Walt Disney World dessert with the Baked Alaska), and it’s easy to see why The Boathouse has already attracted a legion of dedicated fans in only a year. Not Listed – As mentioned above, there are a few Disney Springs table service restaurants that aren’t listed. At this point, these are mostly older restaurants that are either currently being refurbished, about to be refurbished, or about to have their menus overhauled. The above-mentioned restaurants include spots such as House of Blues, Bongos Cuban Cafe, and Rainforest Cafe (which we’ve actually done a few times, and just are not fans). Beyond those, there are also the restaurants that just have yet to open. We’ll add all of these Disney Springs dining options once they are ready! What is your favorite restaurant at Disney Springs? Least favorite restaurant? Do you agree or disagree with these rankings? How would you rank the Disney Springs restaurants at which you’ve dined? Share your thoughts or questions in the comments below! We don’t feel like our vacation has begun until we turn on the room TV and wave to Stacy! We enjoyed Paddlefish, and having a table right next to the window and water was a definite plus. None of us had complaints about the food. We also enjoyed The Boathouse, but it was so hot that day and of course we were stuck outside, so I’d like to try it again sometime and either be tough about eating inside, or get a later reservation! Love, love, love Raglan Road. Everything I’ve eaten has been delicious, especially the appetizers and that bread pudding. Sitting at the bar is a lot of fun. The food at STK is fantastic. I’ve never sat outside, but I like both the patio and the look of rooftop. We’ll be going in April for a chef’s tasting dinner and I can’t wait! Raglan Road is our favorite. We book it every time. Requesting the main dining room at check in is worth the additional wait. We agree! The Boathouse is the best, but certainly pricy. We love the oysters and the filet sliders and the engagement of the staff. You can eat reasonably there, but if you want to splurge….or using dining points, the non-appetizer food is wonderful! Disney springs has upped their game like crazy in the last few years. I’m looking forward to trying all of these, though my brothers tried Morimoto and said it was very underwhelming. We all loved fontera cocina though. Morimoto Asia has a surprising amount of mixed reviews from others. We’ve had several great meals there, but the experiences of others are definitely something people reading this should consider! any updates? I’m heading down in March and looking for a place for a group of 20 on a Tuesday night – thanks! Do all the restaurants charge a high service charge if you book a table of over 6 people? We are 2 families going to Disney on holiday (11 people) and would like to book a table for us all. Oh wow, I completely disagree with Frontera Cocina being ranked so low… or maybe I don’t have excellent Mexican cuisine near me? We visited in April and had an absolutely fabulous meal, including a great margarita and perfectly cooked steak. Now the ambiance left quite a bit to be desired and the service was downright sad, but the food was so great I thought it made up for it! have you added the planet hollywood observatory review to the dining reviews masterpost? Go ahead and try one of the signature STK steaks. I am a self proclaimed steak snob. Just try one! They melt in your mouth! The Boathouse is too darn expensive to even consider trying. And same goes for Fontera Cucuna – cheapiest thing there for an entre starts at $25.00 – please, for Mexican food??? I call Stacey a friend. When I first saw the ‘Vacation Kingdom of the World” sign at Splitsville, I was enthralled. And I thought to myself, I bet Tom Bricker loves this. I hope they bring something similar, but Disneyland themed to the new Anaheim location of Splitsville opening later this year. We had our first visit to The Boathouse this trip. I personally was worried it wouldn’t live up to the hype. Food was great, service was brilliant, cocktails very good. We had planned to go back on Saturday last week (last Saturday of our trip) but Irma ended that. We’ll be back next time for sure! Brunch at Raglan Road is also wonderful! Oh, and Paridiso37 – the corn is fantastic! My family and friends were in Disney in August, and we tried the “new” Paddlefish. We were on the dining plan so price wasn’t a consideration. Having said that, I thought Paddlefish was a little pricey, but the food and service were very good. We really enjoyed our meal, and even though The Boathouse is still better, I think Paddlefish should merit an honorable mention! I should also mention that our “crew” is not really a seafood loving group overall, but everyone still enjoyed their meals! Any places with good vegan options? Or chefs who will go out of their way to make a vegan option that is not just a salad or boring pasta with vegetables? Agree with you on The Boathouse and Raglan Road. Gibson has done an excellent job bringing their steakhouse tradition to Disney Springs. Raglan Road has been our go to restaurant since they opened. Food and atmosphere are great! I would rank Homecoming higher than Morimoto Asia. Restaurant is beautiful but the food is lacking flavor that I would expect from this chef. Homecoming’s fried chicken is the dish to get! Last trip we opted to eat there for lunch and got chicken to go for the flight home. Great call! I’m with you on Raglan Road. The bread and butter pudding is to die for. It ended up being the best meal of our whole trip.